Emergency workers patrol an area of Table Rock Lake in Branson, Mo., on Friday, a day after a duck boat capsized and sank during a storm. Authorities say 17 people died in the accident. 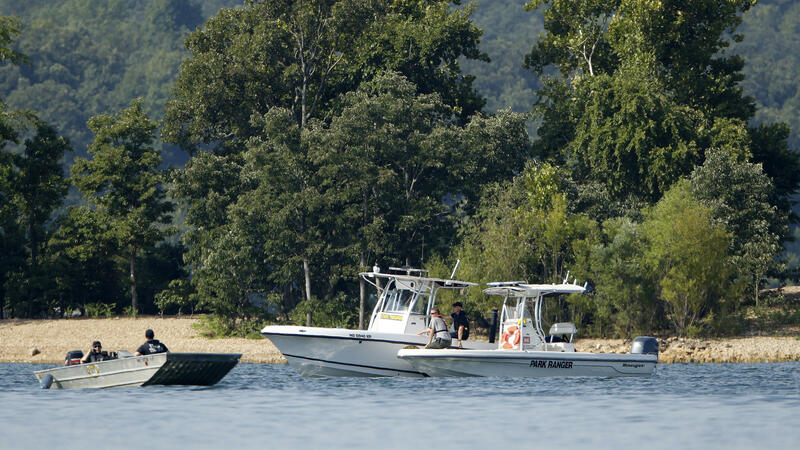 Rescue personnel work after an amphibious "duck boat" capsized and sank, at Table Rock Lake near Branson, Mo., on Thursday. The Associated Press quotes authorities as saying nine of the dead were from one family, and two other members of the family survived. The capsize occurred during a storm that produced gusts of an estimated 60 to 80 mph. Life jackets were available inside the boat, but authorities can't say whether passengers were wearing them. Crews will be working Friday to raise the boat from the bottom of the lake, Stone County Sheriff Doug Rader said at a morning news conference. The captain of the duck boat survived, but the driver of the vehicle was among the fatalities, Rader said. Rader would not comment on the ages of the victims, but Missouri State Highway Patrol Sgt. Jason Pace told the St. Louis Post-Dispatch that they range from the very young to the elderly. Fourteen people survived the sinking. Rader said late Thursday that seven people had been hospitalized, and a local hospital tweeted that it was treating seven patients, two of whom are in critical condition. Rader also said an off-duty sheriff's deputy working security at the Showboat Branson Belle helped with the rescue. The Ride the Ducks Branson tour company posted on its website that it is closed for business while it supports the investigation. "Words cannot convey how profoundly our hearts are breaking," the company said. "We will continue to do all we can to assist the families who were involved and the authorities as they continue with the search and rescue." In an interview with CNN, Missouri Gov. Michael Parson called the incident "just a terrible, horrific tragic accident." "Our prayers are with the victims and their loved ones," read a statement from the White House press secretary. "We are thankful for the brave first responders and dive crews, whose quick and decisive actions have saved many lives, and we continue to pray for their safety as their search, rescue, and recovery operations continue." In a video posted on the Springfield News-Leader's website, patrons eating dinner at a restaurant on the nearby Showboat Branson Belle watched the tragedy unfold. Video captures them noticing two duck boats in the water and commenting about the treacherous conditions. The doomed duck boat can be seen struggling to make headway against a train of wind-driven waves. Then to the gasps of the onlookers, it begins to sink. A video posted to Facebook from an account belonging to the Lakeside Resort & Restaurant on Table Lake shows waves rolling into a dock, with a witness saying "I've never seen it this bad. Boats can't get in, boats can't get out." The National Transportation Safety Board is investigating the sinking. The board is asking any other witnesses, including those with video or photos of the accident, to email witness@ntsb.gov. Jim Pattison is the president of Ripley Entertainment, which owns Ride the Ducks Branson. He told CNN that his understanding was that the weather was calm when the boat went in the water. "It was almost like a microburst," he said. "We had boats out there, it was perfectly calm, and we had a high-speed wind system that just came out of nowhere." The National Weather Service in Springfield had issued a severe thunderstorm warning for Branson and Table Rock Lake at 6:32 p.m. local time. The incident reportedly occurred at around 7 p.m. local time. "Meteorologists say winds could have exceed 65 miles an hour in the storm," reports Blake Farmer of member station WPLN. The News-Leader quotes Capt. Jim Pulley, owner of a Sea Tow service on Table Lake, as saying the storm hit with 80 mph winds that produced 5-foot waves. 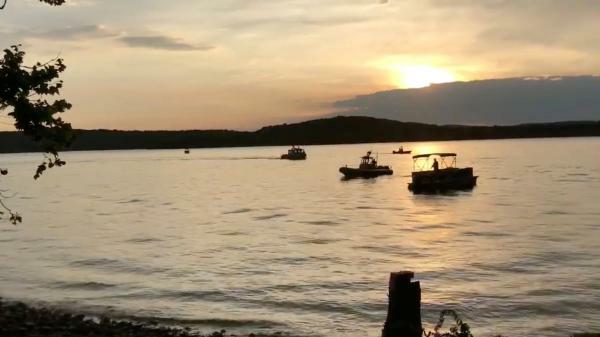 Pulley's Sea Tow boats were helping with crowd control at the Showboat Branson Belle when the capsize of the duck boat occurred. Multiple companies operate duck vehicle tours in cities across America. Some use restored World War II-era amphibious DUKW vehicles, while others use newer vehicles in the style of the original DUKWs. Ride the Ducks International, which recently sold the Branson operation to Ripley Entertainment, has called itself the nation's largest amphibious tour operator and licensor. It operates or licenses duck tours in multiple locations, although the company has sold or shut down several of its operations. In 2010, a Ride the Ducks amphibious vehicle was involved in a water accident in Philadelphia that left two people dead. A National Transportation Safety Board investigation found that a tugboat driver, distracted by using a cellphone and laptop, caused the crash, but that Ride the Ducks staff contributed to the accident by failing to check equipment and by stopping in a navigation channel without taking appropriate safety measures. In 2016, the company stopped operating in Philadelphia, citing rising insurance premiums, The Philadelphia Inquirer reported at the time. In 1999, a duck tour operated by Land and Lake Tours sank in a lake in Arkansas, killing 13 people. Other duck boat accidents have occurred on land, including fatal accidents in 2015 and 2016. Researcher Sarah Knight contributed to this report.